Our two-, three-, and four-bedroom townhomes feature open living spaces, large kitchens, private patios, utility rooms, and attached garages. You’ll find special touches throughout the apartment, such as master suites with walk-in closets and tile flooring. 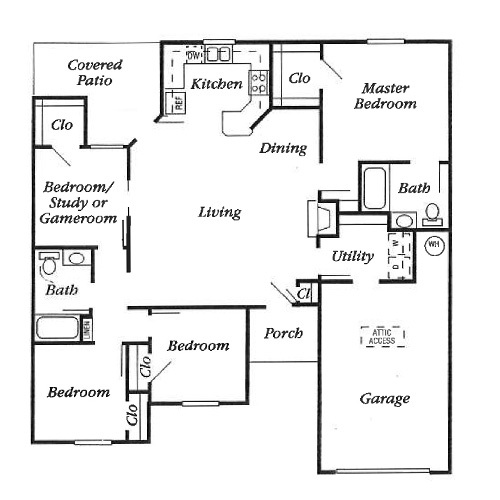 This two-bedroom, 2.5-bath floor plan has 1,200 square feet of living space. On the first floor, you’ll find the attached garage with access to the utility room, the galley-style kitchen, the living room with fireplace, and the dining area that overlooks the covered patio. A half bath is also located on the first floor. The second floor contains the master bedroom with walk-in closet and en suite bathroom, and the second bedroom with en suite bathroom. The Aspen has three bedrooms, two bathrooms, and 1,318 square feet of living space. This is a one-level townhome with an attached garage. This apartment has a large living area, a separate dining area, a utility room with door to the garage, and a galley-style kitchen. The covered patio is located off the living room. 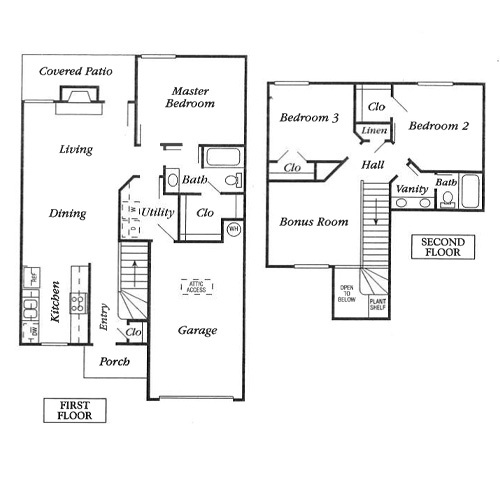 The master suite is in the back of the townhome and features a walk-in closet and full bathroom. This apartment features two additional bedrooms and another full bathroom. 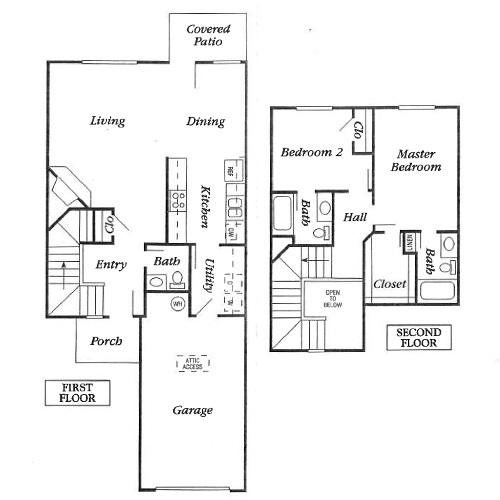 The Timbers is a three-bedroom, two-bath floor plan featuring 1,438 square feet of living space. The first floor contains the garage with private entry into the utility room, the master bedroom with full bath and walk-in closet, the living room with fireplace, a large covered patio, the galley-style kitchen, and the dining room. 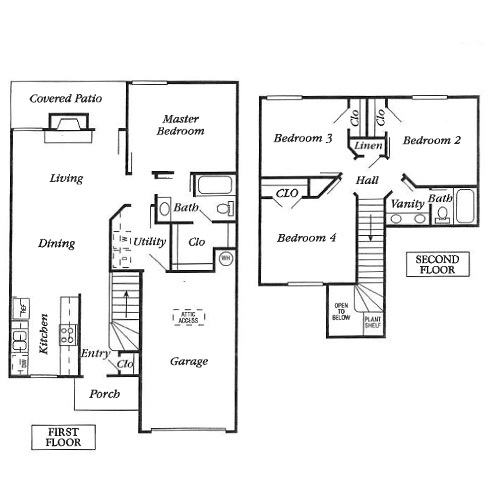 The upper level contains the two additional bedrooms, a full bathroom with dual vanity, and a large bonus room. At 1,439 square feet, this is a roomy three-bedroom, two-bath townhome. The main level features a front porch and a foyer with a coat closet. The attached garage includes a second entrance through the utility room. The galley-style kitchen opens to the spacious living and dining area, which includes a fireplace. The covered patio is located off the living room. The master bedroom is on the main floor and has a walk-in closet and full bathroom. The upper level contains the three additional bedrooms, a linen closet, and another full bath featuring a dressing area with dual vanity. This 1,405-square-foot, one-level townhome has four bedrooms and two bathrooms. 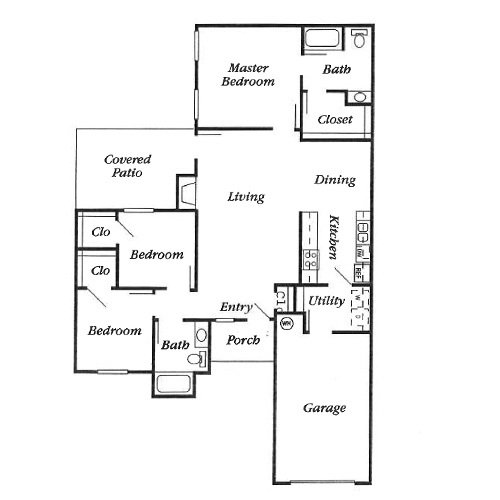 This floor plan includes an open living area, dining nook, and a G-shaped kitchen with island. The master bedroom has a walk-in closet and en suite bathroom. The covered patio is located off the living room. The front porch leads into the living area, while the attached garage has access to the utility room. This split floor plan includes two additional bedrooms, a full bathroom, and a flexible room that could function as a fourth bedroom, a study, or a game room. *Pricing and availability are subject to change. Please call the leasing office for more details.